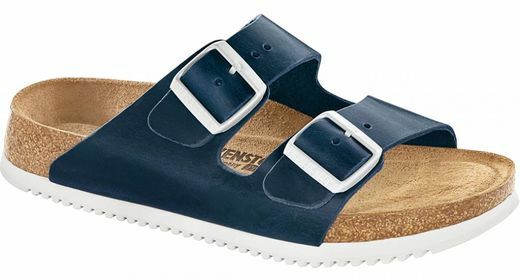 The Birkenstock Arizona with its super-grip sole offers outstanding comfort for anyone who needs to beon their feet for hours at a time at work but still wants to have a stylish appearance. The sandal with a footbed made of cork latex is finished with a two-component sole. This includes a color-contrasting cushioning midsole made of flexible EVA and a non-slip outsole made of genuine rubber. The outsole is oil- and grease-resistant, making it perfectly suitable for everyday wear in medical facilities, kitchens, and restaurants – but also, of course, for leisure wear. 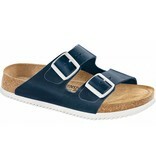 The upper is made of high quality oiled durable and strong leather. The genuine rubber sole has been tested for slip resistance in accordance with the requirements of EN ISO 20347:2012 (SRC category).